THIS ITEM IS NOT AVAILABLE AT PRESENT. WE WILL NOT BE GETTING ANYMORE Star Wars Darth Vader Lightsaber. From the Star Wars collection by Rubies. 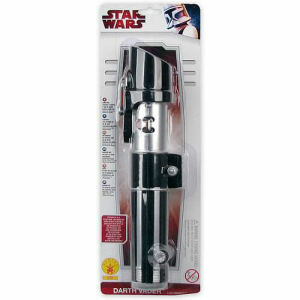 Star Wars Darth Vader Lightsaber. With a blade that telescopes to over 3 feet in length. Requires 2 AA batteries that are not included. For Costume wear only not made for battle.